One of the most exciting chef teams operating in the Sonoma County wine country is Chef Duskie Estes and Salumist John Stewart (wife & husband) who are the proprietors of the newly relocated zazu kitchen + farm located at The Barlow (a former apple juice processing facility restored and reconceived as a home for artisan food producers including boutique wineries) in Sebastopol. Some of the vegetables used at the restaurant are actually grown in large tubs on the restaurant’s inviting patio. They were mentored by pioneering Seattle chef/restaurateur Tom Douglas before relocating to Sonoma County to go off on their own. The original zazu restaurant (part of a former chicken coop) was founded in Santa Rosa in 2001. It was located in a rustic roadhouse way out of town surrounded by rural farms and vineyards. If a local didn’t tell you about it you’d probably never know it was even there. Their regulars include some of the most distinguished winemakers in Sonoma County. The eclectic wine list includes reserve selections that you just don’t see outside of the private stash of the wineries. Duskie and John were living farm-to-table long before that became a marketing buzzword for chefs. They raise their own chicken and ducks to provide the eggs for their fresh pasta and their praise-worthy gelati. Their daughter operates a rabbit meat business. 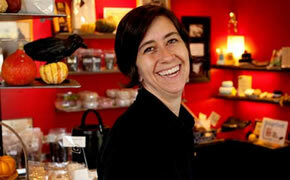 Rachel of Blackmarket Bakery is the underground baker (with extensive training) in Orange County. In 2004 she launched her “hidden” production facility in Irvine near John Wayne Orange County Airport. It was strictly a wholesale operation but somehow determined retail customers sought her out and she couldn’t disappoint them. The game plan is quality using real ingredients and the indulgent products are always made from scratch. No mixes are used whatsoever.